* Start Centerline Offset - Unit of measure: SHORT_DIST. Start Centerline Offset - This item is the starting lateral offset of the TWLTL relative to the roadway centerline. 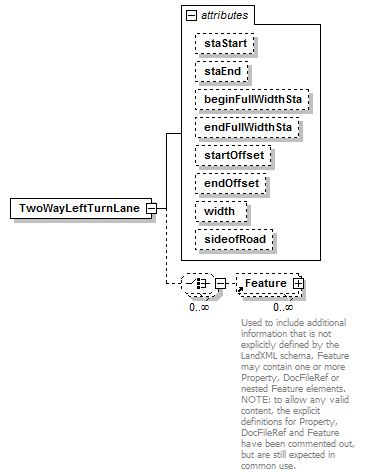 This item specifies the lateral offset of the start of the two-way left turn lane from the centerline of the roadway. A poistive value represents an offset to the right side of the road (relative to the direction of increasing stations) and a negative value represent represents an offset to the left side of the road. The unit of measure for this item is meters (feet). * Begin Full Width - Unit of measure: STATION. Begin Full Width - This item is the station location at which full lane width begins. It specifies the station at which the initial taper ends and the full width begins. Lane Width - Unit of measure: SHORT_DIST. Lane Width - This item is the width of lane. The unit of measure for this item is meters (feet). * End Full Width - Unit of measure: STATION. End Full Width - This item is the station location at which final taper begins. This item specifies the station at which the full width ends and the final taper begins.